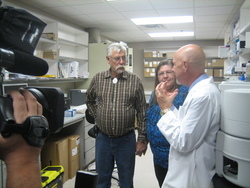 DJH Foundation Founders, Don and Joyce Harvey, tour the research facilities at OU Health Sciences Center. Powerball Lottery winners Don and Joyce Harvey of eastern Oklahoma will soon be featured on national television for turning part of their winnings into a charitable organization designed to research cures for Oklahoma children. The couple won the $105 million jackpot two years ago and will be highlighted in The Learning Channel's series "Lottery Changed My Life" on Wednesday, September 9th. After winning the lottery, the Harveys formed the DJH Foundation and began working with the University of Oklahoma Health Sciences Center to establish a program that will provide mobile research capabilities throughout the state. The program,which is part of the research at the Harold Hamm Oklahoma Diabetes Center, will include the purchase of a mobile metabolic research unit. The mobile unit will travel the state to conduct clinical research studies that will examine the root causes of obesity and diabetes in children. Such data will be used to develop preventive strategies for children in rural areas. "The Harveys are very familiar with how difficult it is to include children in rural areas in medical research projects. And because Joyce is Cherokee she is also very familiar with how many Native American children living in rural Oklahoma are impacted by this disease. So they have a passion for this research and for making a difference in the lives of children in rural Oklahoma," said DJH Foundation Board Member and Spokesperson David Walls. Officials at OU say their research on diabetes in Oklahoma is impacted by the fact that it is difficult to test children in rural areas who may be suffering or at risk for the disease. The mobile unit will be equipped and staffed to collect samples to expand the population included in their research. The Harveys said they were reluctant to be featured on the TLC show until they learned it would raise awareness to the DJH Foundation and possibly help raise money for this and other projects to help Oklahomans. "Once we learned we could focus on the Foundation we created and our plans to raise more money for the mobile metabolic unit and other projects, we agreed to let the film crews follow us around for a few days," said Don Harvey. "The crew was very nice, and we were happy to talk about the Foundation, but we were also glad to see them go." The TLC series chronicles the lives of jackpot winners from around the country, exploring how ordinary people's lives are impacted by winning the lottery. The couple bought the ticket in June 2007 at a Shell Station on Interstate 40 in Roland, near the Arkansas state line. Don, a truck driver, learned of his new fortune one day after his 1989 Freightliner broke down. Now the couple says their plan is to continue enjoying time with family and working on this foundation project as well as others that will benefit their fellow Oklahomans. For more information on DJH Foundation visit http://www.djhfoundation.org. DJH FOUNDATION is a Christian-based foundation seeking to advance the work of 501(c)(3) organizations helping to fight against children's cancer, asthma and diabetes through educational, charitable, scientific, religious and literary methods. Mobile research unit similar to those being built for the DJH Founation.